In the book of Matthew, Jesus stands near the opening of this cave, known as The Gates of Hades, and asks the disciples an important question, "Who do you say that I am?". Simon Peter replies that he is "the Messiah, the Son of the Living God." Our group stopped at Yardenit, a baptismal site on the Jordan River for these special professions. If you're one of the baptized, I have an extended photo collection that will be on the Shutterfly site for you to download! After our boat tour on the Sea of Galilee, we stopped at the town of Capernaum. Located on the northern shore, several events in the ministry of Jesus took place here and the remains of an early synagogue have been clearly excavated. There is also reasonable certainty that Peter's house resides in this city. "After he had finished all of his sayings in the hearing of the people, he entered Capernaum. Now a centurion had a servant who was sick and at the point of death, who was highly valued by him. When the centurion heard about Jesus, he sent to him elders of the Jews, asking him to come and heal his servant. And when they came to Jesus, they pleaded with him earnestly, saying, "He is worthy to have you do this for him, for he loves our nation, and he is the one who built us our synagogue." And Jesus went with them. When he was not far from the house, the centurion sent friends, saying to him, "Lord, do not trouble yourself, for I am not worthy to have you come under my roof. There fore I did not presume to come to you. But say the word, and let my servant be healed. For I too am a man set under authority, with soldiers under me: and I say to one, 'Go,' and he hoes; and to another,'Come,' and he comes; and to my servant, 'Do this,' and he does it." When Jesus heard these things, he marveled at him, and turning to the crowd that followed him, said, "I tell you, not even in Israel have I found such faith." And when those who had been sent returned to the house, they found the servant well." Luke 7:1-10 Wow, to have faith that Jesus marveled at. "So when the crowd saw that Jesus was not there, nor his disciples, they themselves go into the boats and went to Capernaum, seeking Jesus. When they found him on the other side of the sea, they said to him, "Rabbi, when did you come here?" Jesus answered them, "Truly, truly, I say to you, you are seeking me, not because you saw signs, but because you ate your fill of the loaves. Do not work for the food that perishes, but for the food that endures to eternal life, which the son of man will give to you. For on him God the Father has set his seal." Then they said to him, "What must we do, to be doing the works of God?" Jesus answered them, "This is the work of God, that you believe in him whom he has sent." So they said to him, "Then what sign do you do, that we may see and believe you? What work do you perform? Our fathers ate the manna in the wilderness; as it is written, 'He gave them bread from heaven to eat.'" Jesus then said to them, "Truly, truly, I say to you, it was not Moses who gave you the bread from heaven, but my Father gives you the true bread from heaven. For the bread of God is he who comes down from heaven and gives life to the world." They said to him, "Sir, give us this bread always." 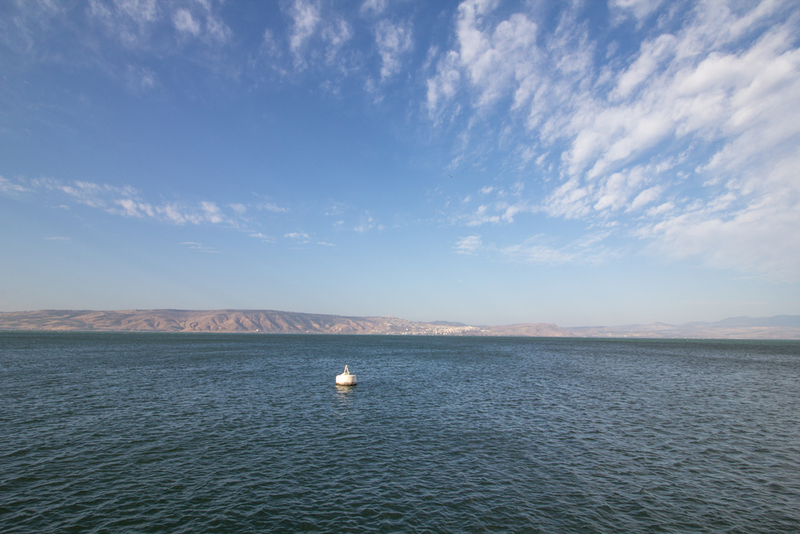 Being on the Sea of Galilee was a bit surreal. So much of the New Testament takes place in or around this area that being here, on a boat, really brought the Bible to life for me. On the beautiful, sunny day that we were scheduled to board a boat from our hotel's side of the sea and sail across, the water was particularly choppy and we instead had to drive around to a different docking point. In the clip below, you can hear how strong the wind was on the day we went out. It almost knocked us over! Reading the story of Jesus calming the storm and Jesus and Peter walking on water growing up, I always thought the disciples were a little weak and wondered how they could be afraid since Jesus was with them. Now, having been to where both of these events took place, I view the disciples in a different light; they were still human and they didn't have the whole picture yet. Sitting on our sturdy boat on a sunny day, the wind was still overwhelming. I imagined the type of boat that they would have been on at the time and how much worse real stormy conditions would have felt. Located on the former trade route known as the Via Maris (way of the sea), Caesarea was an important pagan seaport in the ancient world. Built by Herod the Great, this town was a staple on the route connecting Ancient Egypt to the Roman world. With it's impressive facilities, the city regularly hosted tournaments which included chariot races and gladiator fights (in the hippodrome), as well as theater performances (in the amphitheater). The remains of early aqueducts are still visible a short distance up the road.